When 2012 rolled around, Japan’s Koichi Iwasa had been running for a half decade. That year, he was signed up for the inaugural Ultra-Trail Mt. Fuji. With about 2,000 runners on the starting line, Koichi would be among the first to participate in the 170-kilometer event near Mount Fuji, Japan’s tallest mountain. It would be Japan’s spark into the international ultrarunning world, and also the spark for some important changes in Koichi’s own life. Ultra-Trail Mt. Fuji (UTMF) represents a blending of the beauty and love of nature, the trails of Japan, and the capabilities of the human body and mind. The race connects the local trails, paths, and roads around Mount Fuji. A shorter sister race called Shizuoka To Yamanashi (STY) takes place at the same time. UTMF and STY were created by Tsuyoshi Kaburaki, another Japanese ultrarunner who modeled the race after what he experienced when racing internationally at Western States 100 and UTMB. These days, UTMF has grown into an international-caliber event. 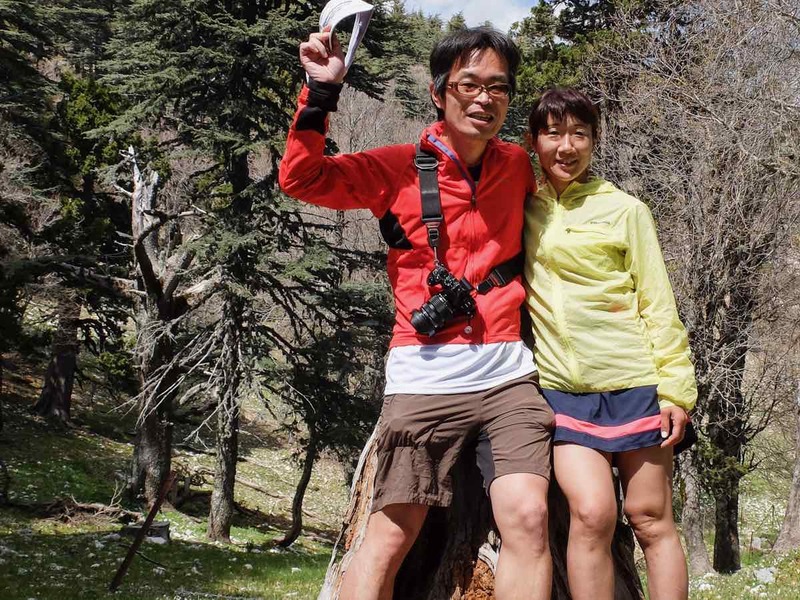 For Koichi, it was the same influences that shaped UTMF which developed him into the runner he is–friends and inspiration cultivated at Western States, professionalism and skills developed at UTMB, and his desire to live life to its fullest. Koichi is who I would call the Bryon Powell and Meghan Hicks of Japan. All three runners, all three with an endless global friends list, and all three with a deep passion for the sport of ultrarunning–these are the masters who keep ultrarunning on everyone’s minds. Koichi is the founder of DogsorCaravan.com, where he shares Japan’s ultrarunning news. The name stems from an Arabic proverb, and though he has had several chances to change it to something more attuned to running in Japan, the name has stuck in the browsers of computers all over the world. He never used to be this one-man ‘running band,’ but once he jumped in with both feet, he never looked back. 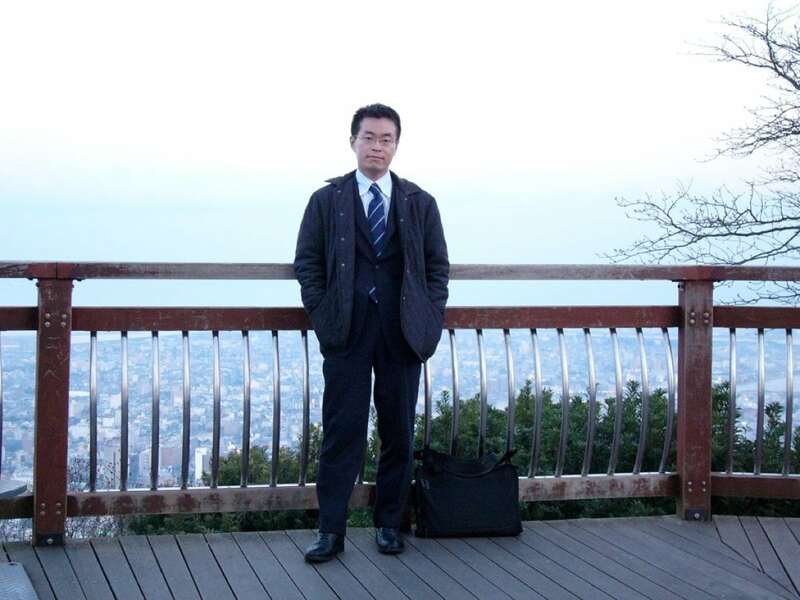 Koichi grew up in the Shiga Prefecture in Japan, then relocated to downtown Tokyo during his time at the University of Tokyo. He earned his Master of Business Administration at the Yale School of Management in the U.S. in 2000 with the ambition of a career in business. He settled into a telecom company as a financial analyst, which he really enjoyed, yet after 10 years, he unhappily found he had gained nearly 25 pounds. So, at 37 years old, he began running. Koichi ready for work in 2002. All photos courtesy of Koichi Iwasa unless otherwise noted. In 2012, he moved to Fujisawa, which was the year he met his wife Hitomi Iwasa, also an ultrarunner. Well, as it often does, shorter training runs on the roads turned into road half marathons and full marathons in Tokyo, and then eventually he turned to the trails. The “guru” of Japanese ultrarunning, as Koichi calls him, Tsuyoshi, had just placed third in the 2009 UTMB and was featured in a documentary film on NHK, a national TV network in Japan. Afterward, Koichi set out to follow in his footsteps, literally. 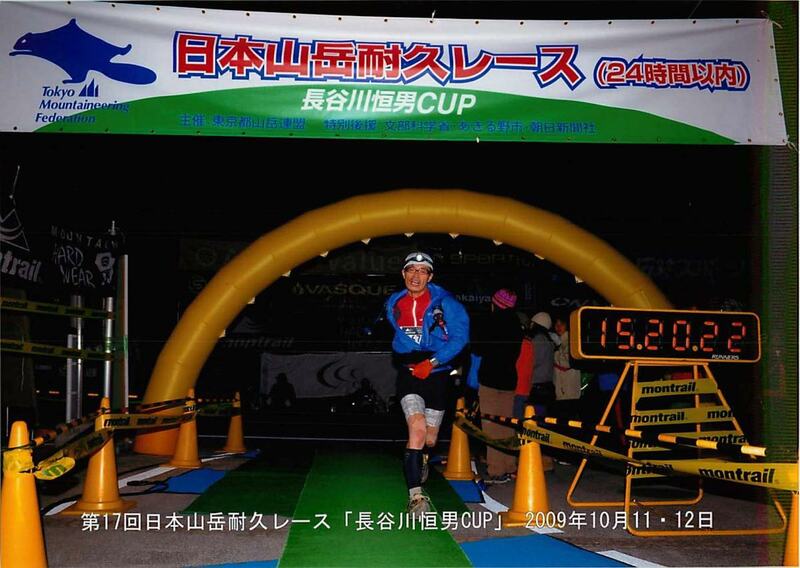 Still in his first year of the sport, Koichi did his first ultramarathon, a 71k race called the Hasetsune Cup, a very difficult and respected Japanese trail race. It started at 1 p.m. and ran through the night, with just one aid station. During the race, as the sun sets, runners could gaze upon the beautiful Tokyo skyline and Mount Fuji profile. When you go to Japan, expect to find breathtaking views and an environment not too different than what we find in North Carolina or Virginia in the U.S., with its four seasons and warm, humid summers. The mountains are big, steep, and difficult. And even on the country’s flatter lands, Koichi says it is a constant stream of rolling hills. And, much of them are woven through humid, dense forests. 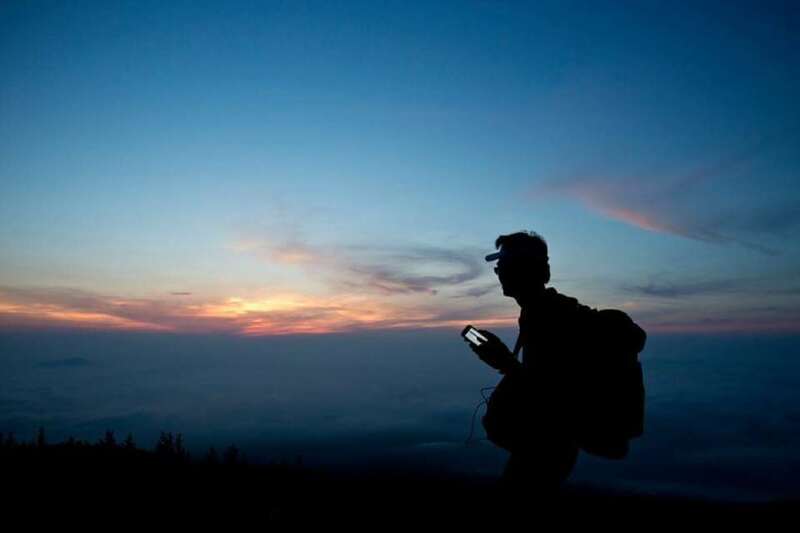 “On the map, the trails don’t look so challenging, but once you put your foot on the trail you will be tired because of the ups and downs,” he explained. You will also find runners willing to show you around. 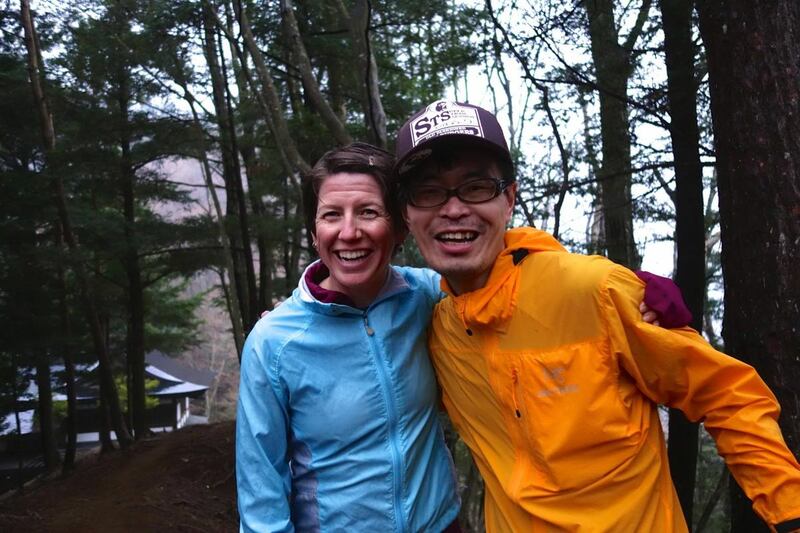 When Koichi first started running trails, he met and gained new friends each time he went out for a weekend long run. During the week, he typically wakes up in the morning to run up to 14k, depending on his schedule and upcoming races. He met even more people by attending a training camp put on by Tsuyoshi, which also helped him prepare for his first UTMB and Western States. He was unable to get into the UTMB lottery in 2010, and instead signed up for the Sur les Traces des Ducs de Savoie (TDS)–a part of the UTMB festival of races–but it was cancelled due to heavy rains. In its place, he ran a reprised UTMB, which was half the course starting at Courmayeur. Koichi and his wife Hitomi. Motivated and ready, he made it to the UTMB starting line in 2011 and finished in 38 hours and 49 minutes. “It took me much longer than I expected, but I was really happy with that experience,” he said. With one international race done, he set his eyes to others, which led him to Western States. When Koichi ran the California race for the first time, he finished in pain but happy in 25.5 hours. After a year of training for those last 40 miles–repeating eight to 15k long uphill runs–Koichi came back to finish in 23 hours and 44 minutes. “I was very lucky to get the silver buckle [for finishing under 24 hours] that year and it is my personal epic or my ultimate career run to now,” he said. Another thing he experienced in California was the ease of meeting ultrarunning friends. When he arrived in Olympic Valley, at the race’s start line, in 2012, he was alone with no crew or pacer. He ended up meeting Roxana Pana and Willy Onate, who are still good friends. He also met Sabrina Okada in Robinson Flat on race day and told her that even though he didn’t have a pacer he would be okay. Another act of runner kindness was when Koichi agreed to pace his hero Tsuyoshi at the Hardrock 100 and was shocked to find it was nearly impossible to drive to the aid stations in the San Juan Mountains. Thankfully, friends Justin Angle and Jon Webb helped him navigate this new challenge. All this was the inspiration he needed to change paths–or trails, you might say–and commit to a life more focused on the ultrarunning world. Journalists at the 2018 UTMF. At Western States, Koichi also met iRunFar’s Bryon and Meghan, but it was actually back in 2010 when Koichi first stumbled upon iRunFar. He was looking for information on how to prepare for UTMB, but was sucked into the website’s race results, interviews, and gear reviews. 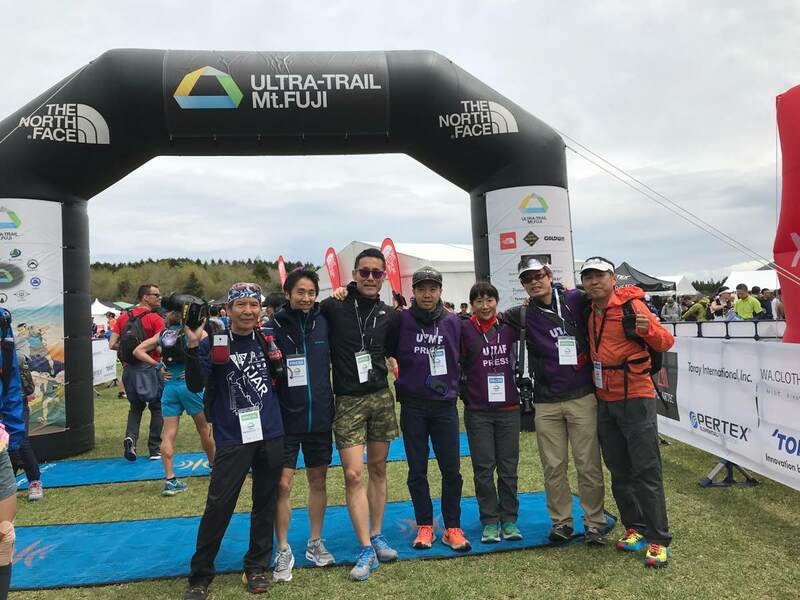 UTMF became the first trail and ultra event in Japan with international athletes and global attention, and its success convinced Koichi that the ultra community needed a news media to connect Japan and the world. He felt that the Japanese running community did not have access to trail running resources. There was also no recognition for local running heroes and their stories. Koichi was losing satisfaction in his job as a financial analyst. He was someone who loved to read those stories and who thought he could make a life out of reporting on Japan’s ultrarunning news. The 2011 earthquake and tsunami in Japan were scary and eye opening. They forced Koichi to ask himself, What is my worth? Am I living my life with no regrets? DogsorCaravan.com started off as his personal blog and has now turned into a hub of racing, results, reviews, and interviews with runners from all over the world. It is not just written to share stories from Japan with the rest of the world, but also to bring outside news to those in Japan, networking runners together. Now, instead of running UTMF, Koichi has been reporting on the race for the last five years. His work has given him a premier spot to watch the rise of the sport and to meet new runners, both from Japan and abroad. He watched American Dylan Bowman win the 2018 UTMF and saw up-and-coming Japanese runner Ruy Ueda blast the course record at the Hasetsune Cup one year. He has noticed how ultrarunning in Japan has grown, but believes a few more good role models, both male and female, would help give others a hero to look toward, like he had. Plus, a big perk, and his favorite part of the job, is traveling to other races where he can see firsthand how the world of international racing is changing. 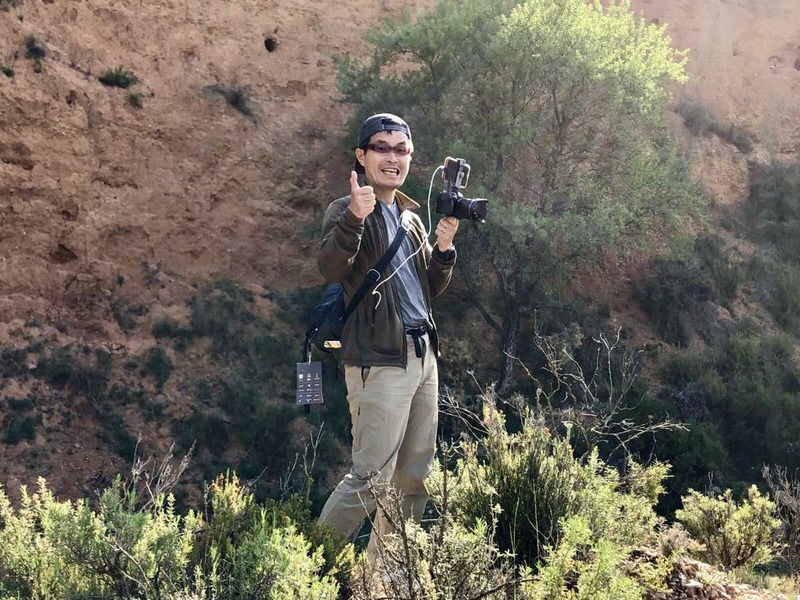 Koichi was invited to the 2017 Marathon des Sables as part of the reporting crew, and had a great time traveling with other journalists for seven days. He has helped out either reporting or translating at many European races, such as Transgrancanaria. He has additionally helped iRunFar cover races in Japan and around the world a number of times. Yet, with his own website, keeping it up to date and balanced is still a learning act each day. As a business man turned journalist, he had no experience with writing or photojournalism. Yet, he jumps on every opportunity to travel to new places and makes it work. 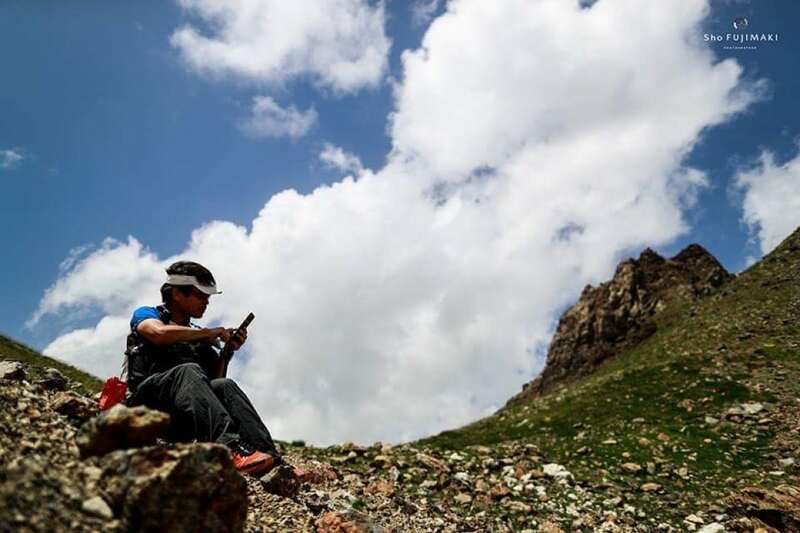 He reads iRunFar for inspiration on different stories, he works with Japanese brands for gear reviews, and he follows the work of fellow photojournalists like Sho Fujimaki and Shimpei Koseki. To Koichi, the work is worth it, because DogsorCaravan does what he believes was needed in his community. 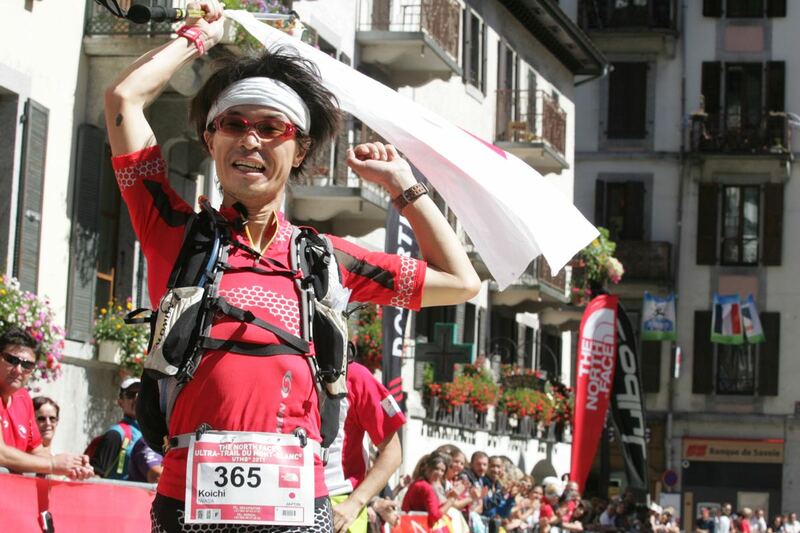 Now, when Koichi arrives at the UTMF race site each year, wearing a camera instead of a race bib, he is acknowledged. He is known and thanked by locals and foreign runners for being there and being devoted. They are the readers of DogsorCaravan and they are just as enthusiastic, thanks to Koichi’s own work and enthusiasm. It’s safe to say that not only has Koichi brought international ultrarunning to Japan, but he has brought Japanese ultrarunning to the world. Do you know Koichi Iwasa of DogsorCaravan? Can you comment to share a story about running or working as a journalist with Koichi? Jessica Campbell :began her iRunFar career as an intern. A former 'swammer,' Jessica turned her passion of endurance sports to marathon and ultrarunning. She lives on the shores of Lake Michigan and works as a journalist for a small-town Indiana newspaper. What a great article on Koichi!!!! He is indeed the Irunfar equivalent of Japan!! I remember meeting him before WS in 2012 at Escarpment, he was wearing Altras that day, same model I was wearing and that caught my eye. It was a great honor to pace Koichi on Cal Loop at WS in 2013 - and see him persevere through the heat and stomach distress. Love what he brings to the ultra-running community as well as IrunFar and all you have done!! Thank you!! I like in Chigasaki, which is one town over from Fujisawa. I'm pretty sure I've seen Koichi-san running on the beach bike-path.